Posted 9/11/2018 4:24pm by Josie Hart. Sign up now to learn how to make this healing and healthy drink with CSA beets! Class will be held in the CSA outdoor kitchen. Thursday September 13 at Chatfield Farms from 4:30-6 p.m.
Posted 9/7/2018 2:41pm by Josie Hart. Tomorrow is Gleaning Day! We invite you and your families to come out between 8-10 a.m. to harvest some crops before they get mowed and plowed back into the ground. We'll have arugula, kale, collards, summer squash, cucumbers, melons, winter squash, basil and beans. When you get to Chatfield Farms, park in the gravel lot and walk past the Hildebrand Ranch House and animals out to the dirt road. Take a left, walk past a pond and then our beehives on your right. Turn left into the fenced in fields just opposite our compost piles, and there will be volunteers to orient you, a list of crops and flags marking areas to be gleaned. There will be signs to guide you. Bring your own supplies, like gloves, knives for harvesting and bags or something to put your harvest into. Spaghetti squash is a fun and easy break from pasta. Just slice it in half, scoop out the seeds, and roast in a 350 degree oven until tender. Let it cool a little bit, then take a fork and separate the strings of "spaghetti" from the skin. Since we have shallots and parsley this week, Chloe suggests trying it with a chimichurri sauce. Shallots are sweet and mild with a flavor that I think of as combining onion and garlic. I like spaghetti squash with a sweet, fresh tomato sauce, not even cooked down too much. You could also pick a ton of basil at gleaning day to make pesto with, since there's garlic this week in the share. Really, its hard to wrong! Posted 9/1/2018 1:30pm by Josie Hart. Next Saturday (September 8) is Gleaning Day! We invite you and your families to come out between 8 and 10am to harvest some crops before they get mowed and plowed back into the ground. A number of plantings are slowing down enough that it no longer makes sense for us to spend the time picking them when we still have so much work to do. This includes collards, summer squash, cucumbers, melons, winter squash, basil and beans. Gleaning is an ancient practice that predates but is discussed in Deuteronomy and Leviticus in the Old Testament. There have been many rules and customs regarding the practice but essentially and at minimum it means that farmers should let the needy harvest the leftovers from their fields after the farmer has taken the economically viable portion of the crop. To honor this tradition we've invited UpRoot Colorado to join shareholders to glean produce to bring to families experiencing food insecurity. When you get to Chatfield, park in the gravel lot and walk past the Hildebrand ranch house and animals out to the dirt road. Take a left and you'll walk past a pond and then our bee hives on your right. You'll take a left into the fenced in fields just opposite our compost piles, and there will be volunteers to orient you, a list of crops and flags marking areas to be gleaned. Please remember to bring your own supplies such as gloves, knives for harvest, and bags or something to harvest into. Speaking of bees, Chatfield honey is back! Our beekeepers Bob and Josie Dolezal are excited about the quality of the honey this year, although quantity is down considerably. With the dry conditions this summer plants have had less nectar for the bees, and so the bees had to dip into the honey to keep themselves fed. We'll have pints for $15 and a limited number of quarts for $30 starting this week, and if you miss out this week we'll take your name down so you can hopefully get some in the coming weeks as they bottle up what they've harvested. Delicata squash is great roasted because the skin is tender enough to eat, so you don't have to peel it like other winter squashes. I generally set the oven to 400 degrees, and you can either slice the squash in half lengthwise, or if you want to minimize time the oven is on you can then slice the halves into little crescent moons. Sprinkle with salt, pepper, and oil. For a wintry preparation try roasting the squash with onion slices and maple syrup and sage sprinkled on it as well, or for a more summery version try it with tomato slices and garlic. Posted 8/11/2018 11:29am by Josie Hart. I've written here before about the importance of crop rotation in organic pest management, and we are pretty rigorous about our rotations, but it turns out there are limits to its effectiveness when the pest is a bear that weighs 200 pounds and has a range measured in miles not feet! So we're fixing fences and gates around the field now, in hopes that we do have some melons to harvest next week since they are oh-so-close! We are also going to harvest some lavender bunches for everyone this week. In previous seasons we sold them at distribution but with another half-acre planted this season there's plenty to go around! Sautee zucchini for a few minutes and combine with diced tomatoes, cucumber, bell pepper, green onion, and garlic in a large bowl. Stir in salt and let them sit overnight to draw the juices out. Posted 8/4/2018 11:55am by Josie Hart. It's that time of the season when we are just trying to keep up with the harvests! 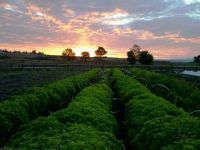 We harvest all greens and herbs the morning of distribution and pick tomatoes on a regular basis to ensure we are able to pick as close as possible to the height of ripeness and flavor; summer squash and cucumbers we pick every day except Sunday. This is unusual but we're going to go back to back with chard this week. We have three plantings all pickable right now, and the harlequin beetles have gotten to our older plantings of collards and kale, so rather than spray pesticides, we'll just mow down the old plantings and wait on the new ones to mature. They're in different fields, and we spent some time actually picking the beetles and their eggs off the plants into buckets of soapy water. That's farming without pesticides! Below is a recipe from our pickler extraordinaire, Royce, which uses a lot of this week's produce in a novel way. Prepare a brine by dissolving salt in 1 quart filtered or distilled water. Slice the stalks away from the leafy part of the chard. Chop the stalks into desired sizes, from little chunks to long spears. Put the dill and the red pepper flakes into the bottom of a clean, dry quart jar. 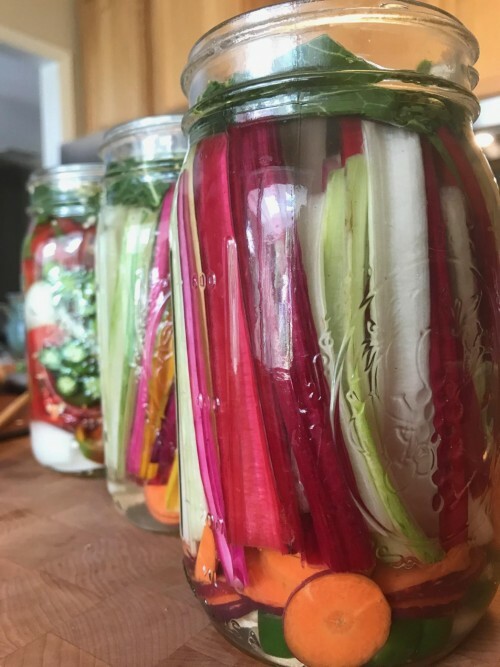 Put the chard stalk in and fill the jar with enough brine to cover the stalks but leaving at least 1 inch headspace in the jar. Cover with an airlock fermentation lid or regular lid, tightly closed. Place the jar in a cool place away from direct sunlight for 24 hours, tasting the chard once it starts to ferment and monitoring it daily. Water may need to be added to keep the chard submerged. Ferment 2-5 days at room temperature. Once chard is fermented to desired taste, place a lid on the jar and store in the fridge. The chard stalks will keep for up to 2 months. Posted 7/28/2018 12:44pm by Josie Hart. We hope you enjoyed the first tomatoes of the season! The firsts continue as we'll start picking beans next week. We might not have quite enough to give out for everyone right away but soon they'll be booming too. We enjoyed this last week of rain quite a bit, although it did set back some seedings, with fields today still a bit too wet to till. We'll try again tomorrow! Most of our fields have a fairly high clay content, which means that the individual particles in the soil are very fine. With less air space in the soil than in a more sandy or loamy soil, it is much more prone to compaction, such as driving a heavy tractor on wet soil. We've changed our growing process a bit in the last few years to try to address this, one example is that we now have permanent beds, so the tractor tires are always driving over aisles and not in the bed where the plants will be growing. We also try to keep our soil covered with plants as much as possible, since compaction happens not just from a thousand pound tractor, but also from raindrops hitting the soil with all the force gained after falling thousands of feet! I said early on in my tenure here that I would never complain about rain in Colorado, and I am sticking to that rule! I'm including another fennel recipe, since it's one of my favorite vegetables, and we'll have another round of fennel in a couple of weeks (we thought we'd give you some time to deal with the monsters you got last week!). I'm also just excited to include a dessert recipe, which maybe gets not enough attention in our featured recipes, and is one of my favorite meals! Lightly coat eight 6- to 8-ounce ramekins with nonstick cooking oil spray and set aside (disposable foil cups are okay to use). Refrigerate a large stainless-steel mixing bowl so that it is well chilled. Cut the feathery tops off the fennel bulb; chop enough of the most delicate fronds (about 1/2-inch lengths) to fill 1/2 cup and set aside. Cut the bulb in half from stem to root end and then cut into very thin slices. Place the sliced fennel, heavy cream, milk, sugar, honey, salt and pepper in a large saucepan. Bring to a boil over medium-high heat, stirring to ensure that the sugar has dissolved, then remove from the heat and let the mixture steep for 15 minutes. Strain, discarding the solids. Add the liqueur and the softened gelatin and stir until the gelatin has completely dissolved. Divide the reserved chopped fronds among the ramekins, then fill the ramekins with the panna cotta mixture. Cover with plastic wrap and refrigerate for 6 to 24 hours, or until set. To serve, run a knife around the inside of each ramekin and invert the panna cottas onto individual plates; they should come out easily, with the fennel fronds displayed on the top. Scrape the seeds from the grilled vanilla bean halves into the chilled mixing bowl. Add the remaining 2 1/2 tablespoons sugar and 1 cup of heavy cream; use a hand-held mixer on high speed or a whisk to beat to soft peaks. Carefully fold the grilled berries into the whipped cream and spoon over the panna cottas. Serve immediately. Posted 7/23/2018 2:47pm by Josie Hart. We hope you enjoyed those fabulous cherries! Next week will be our first round of peaches from the Hotchkiss area of the Western Slope. We will send you a reminder on the same day so you don't forget to pick them up. There is always a lull between fruit crops in Colorado - especially between cherries and when peach season happens. You have not missed any distributions of fruit after the bags of cherries. Because we are a CSA, we partner with fruit growers before the season starts - this means that each small farm has their own schedule for when harvest happens depending on several factors from elevation to weather and so on. As we get into apple season, you will be picking up fruit every week until late October. Posted 7/23/2018 1:29pm by Josie Hart. Greetings from Josie Hart, Farm Program Manager! I want to let you know about some very cool and TASTY events we are rolling out just for YOU. Tuesday (tomorrow) we will be at a new location for distribution! Teller Elementary is located on 1150 Garfield St, 80206. Same time - 4 p.m. - 7 p.m. plenty of parking. Tomorrow and Thursday Fortuna Chocolate will bring you the very finest in ethically produced chocolate, freshly made by hand with farm ingredients! Please bring cash or card to distribution with you if you would like to support the most delicious and locally made confection around. Space is limited on these classes, as they will take place in the outdoor kitchen during CSA distribution so please SIGN UP NOW. Posted 7/21/2018 10:07am by Josie Hart. It's Lavender Fest! If you're sipping your coffee and wondering just how you'll spend this beautiful Saturday, come on down to the farm! With a concert happening this week on Tuesday we'll be moving distribution to Teller Elementary at 1150 Garfield St (80206). The parking lot is located on the north end of the building on the corner of 12th and Garfield. Look for our tents and box truck. Thursday's distribution is same time, same place. Set aside stalks and remaining fronds. Slice bulbs 1/4 inch thick and toss with carrots, onion, garlic, 3 tablespoons oil, 1/2 teaspoon salt, and 1/4 teaspoon pepper. Spread in a 4-sided sheet pan and roast, stirring occasionally, until browned and tender, 25 to 30 minutes. Blend half of vegetables in a blender with broth until very smooth. Transfer to a medium saucepan. Repeat with remaining vegetables and water. Thin to desired consistency with extra water and simmer 2 minutes. Serve soup sprinkled with reserved fronds.